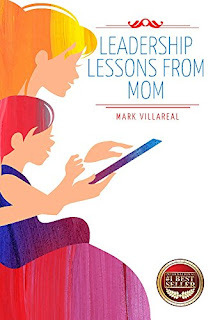 Today’s special guest is Mark Villareal and we’re talking about his new leadership book, Leadership Lessons from Mom. Mark Villareal is the author of the International Best Seller Shortcuts Get You Lost! A Leadership Fable of The Dangers of the Blind Leading the Blind. The book reached #1 status in the U.S., Canada, Australia and #12 in the U.K. Mark Villareal has been an established public speaker, presenter, coach and consultant for many years. He has been a guest on The Viki Winterton Radio Show, The Dr. Jo Anne White Radio Show, The Energy Shift with Sonia Bueno de la Torre, The Dare To Dream Show with Debbi Dachinger, and Talenttalk Radio to name a few. He has had multiple articles published in magazines and publications. Mark Villareal has a passion for developing people in a manner that helps them achieve their goals. Villareal has been helping business leaders succeed for 35 years. Early in his career he realized that the more he focused on others' success, the more his career blossomed as well. It is with a servant’s heart that Villareal has helped employees and managers reach their next level of success. Villareal has had the innate ability to quickly identify high-potential individuals. He mentors them via personal instruction; professional development plans, and focused coaching. He has assisted in developing consultative sales executives, managers, and business leaders. Villareal has a passion for leadership development and has a hunger for continued growth and development. He believes strong leaders pay if forward. Welcome, Mark. Please tell us about your current release. My mother I quote was the best leadership coach who chose to be a housewife. The book describes and demonstrates the lessons she taught me throughout my lifetime and how they formed my character and who I am. The book correlates those lessons to business and leadership today. I am amazed by women in leadership and in addition, working mothers, whether single or married at how they balance their life and yet still make a tremendous impact with the raising of their children. I believe that mothers make the most important impact of our future leaders of tomorrow. Many years ago I had the privilege of employing several single mothers that drove my success. It was grown organically as one single mother would recommend another. Their “I cannot fail” attitude drove their own success and drove my overall success. That business won an award for the most outstanding location of that business of over 260 Worldwide. I make it a point to pay it forward. The book is not only a testament to my mother but all women. As the next few years went by, and as I made other choices that would have repercussions, Mom at least wanted me to learn valuable lessons that she believed at some point would bring me through any consequence. No matter if I was going to be a Rocket Scientist or a Restaurant Cook, Mom wanted me prepared to succeed, be the best at what I chose, and have lessons to teach others. That is the true mentorship of a leader. Mom knew that we were at a point where she could not change my direction, so she made me better prepared for the direction I was headed. What a wise woman. I can still remember our conversation and her words, and like Mom, she repeated them many more times throughout my life. She hugged me, and left my room. I am expanding more in my speaking engagements and workshops to help businesses. I am scheduled to speak at several women entrepreneur events. I also mentor several women aspiring to grow into leadership. Of course I have my third book outlined and in the works. The next book is business focused on key points that organizations need to do, or can fail to do for success. Funny but I have written for a while, almost 20-years, but more for manuals for business process and education. My first book I wrote several years ago and it sat unfinished until I refocused my efforts on its completion over a year and a half ago. It was published in 2016 and became and International Best Seller, which I am humbled by. I write blogs to help share what I consider important messages of learning and education. Hopefully they are motivating as well. I combine writing with mentoring others, coaching, and consulting. In addition, I do public speaking. So my day starts with exercises assigned by my speaking coach that include breathing, posture and voice exercises. My coach is awesome. I then spend about 2 to 3 hours a day going over my speaking and speech for the next event. I tend to do more writing in the evening. Leadership Lessons From Mom was almost all written at night time. Not sure if I have an interesting writing quirk. I would state that I have many ideas that come in the middle of the night that wake me up. So I wake up, grab my cell phone, and either text the ideas to myself or email them to myself. It is important I do this as I have at times thought that I would remember the idea and unfortunately I do not. I have found it invaluable to text or email when the idea is fresh and clear. As any child I went through a lot of phases, but around the age of 13 I wanted to learn and be in the computer technology industry. I had visited my father’s work and at that time a computer was the size of a refrigerator. Anyway I brought home a computer book from his office and started studying it then. Funny but I was in technology for 20-years. Yes, to follow up on the question on what I wanted to be when I grew up. I tell the story in my book about how at different times I would tell my parents that I wanted to be an Astronaut, a Police Man, or a Fireman, etc. Each time as a child my parents would encourage me and I believe we as children do this to impress our parents. Finally as I was developing in age my mother stopped me and told me what she wanted me to be. She stated, “Mijo, which means my son, the one thing I want you to be that would put a smile on my face is a good example. If you make sure you are a good example as a son, brother, friend, husband, father, employee, etc. then I will be satisfied. That is what I ask of you. Be a good example.” Hopefully she is smiling from heaven. Thanks for being here today, Mark.